Loving this article from Chrislovesjulia.com on various ways to display art in your home! Meet the artist! I will be in Los Angeles for this opening event (cocktails, desserts, music!) and would love to see you there. Click here for your invitation to a wonderful opening event on Hollywood Boulevard on Sunday, March 31! Music, cocktails and new artwork including my own will be on display in the Art, Sweet Art exhibition. Please stop by if you are able! RSVP if possible as well. Congratulations to the participants in my introductory workshop at the Las Catalinas resort on the west coast of Costa Rica. Inspired by nature, the group was so excited to include found objects and explore color, texture and mood. Opening Reception for 50 to Watch, up and coming artists, this weekend! 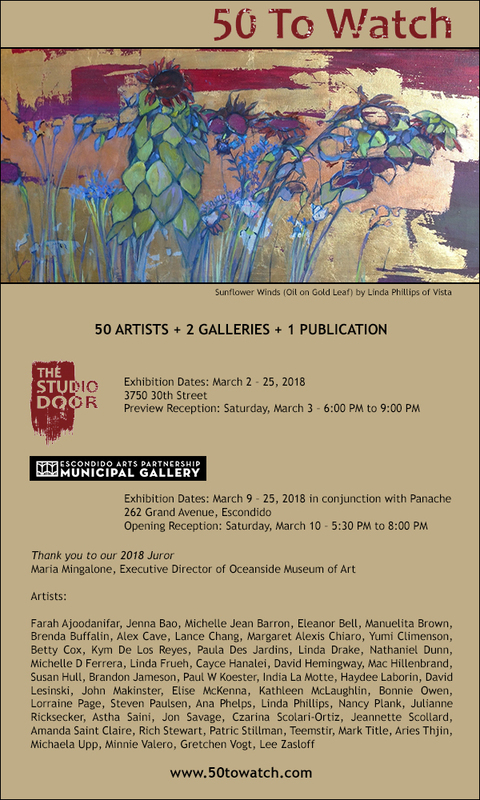 Please join us this Saturday night at the Escondido Arts Partnership to see the work of the 2018 "50 to Watch" artists! Every October, artists throughout the San Diego area open their studios to art lovers, decorators and friends. Please join me at Atelier Frueh, my studio showroom, between the hours of 10am and 5pm on Saturday, October 14 or Sunday, October 15! See page 32 to read Space Contained, a description of my year's journey in creating sculptural vessels from fabric and encaustic. The work was funded by a 2016 Emerging Artist Grant from the International Encaustic Artists association. The corporate offices of Delsen & Co (www.delsenco.com) have selected over a dozen pieces of my artwork for their new office suite. This piece, Ghost Image, is the first thing a client will see upon entering the suite. Please Join me at this art show in San Francisco on Saturday, Dec 10! I am excited to be visiting my adopted home town and community to be part of the Conceptions Contemporary Art Show this weekend! Check out the artists and venue and please consider stopping by. There will be a bar and music, so also a cover charge at the door. Advance tickets can be purchased here. You are invited to attend the second Conception Art Show. An evening of contemporary art, networking and libations at Laughing Monk Brewing. Conception exhibits have been featured in The Wall St. Journal and ABC News and offer collectors the opportunity to purchase work directly from local artists at the tipping point of their career. Pick up affordable original artwork in the heart of the North Park arts district. I have several pieces in the Gallery. In collaboration with the San Diego Art Loft school, my next workshop will be held on Monday, December 19th, from 5:30 to 8:30. All levels welcome, no experience required! We had a lovely session of exploration and creative use of tools and techniques in encaustic! Come to the Photo Encaustic workshop at ArtLounge in Encinitas next Thursday and bring your treasured images - originals or laser printed copies. No experience required. So. A conversation with a gallery. Their clientele buys very large art. Minimum 48", often 72". I went to the website and admired....simply admired the gorgeous work shown there. And of course, I went bigger. First, a 36x40" panel (November Rain.) Then a diptych of 24x36" panels (Marching Orders). And now I'm working on a humongous 48x48" piece. All I can say is, this is a whole new ball of wax. Composition is challenging when you can only see a piece accurately from across the room, or standing on a chair. Attaining smooth areas in scale is immeasurably more difficult than on a small piece. For example, it's easy to pour wax onto a 12x12" for a glassy surface. 48x48"? Not so much. First you have to find a pot that will hold that much wax. I will be posting pictures as I move forward with this large piece, sharing insights and challenges. It was a great challenge to take on because I'm learning so much. That, of course, means error after error. I've just become a featured artist by Manhattan Arts International! Linda Frueh is a contemporary encaustic artist living in San Diego, CA. 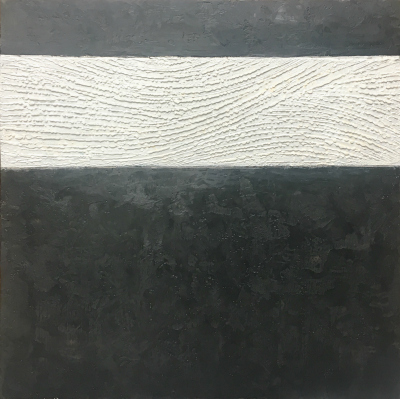 Building layers upon layers of molten beeswax, pigment and damar resin, she creates works with rich surface textures and subtle palettes. Her art has been described as serene, sensual, and even edible. She was recently awarded a 2016 Emerging Artist Grant from the International Encaustic Artists and has been selected as one of 50 Contemporary Artists to Watch in the San Diego area. All rights reserved. Do not copy an image without the artist’s permission. Linda Frueh, Splash Vessel, encaustic and cotton, 18″ x 9″. Frueh’s most recent work includes a series of fabric vessels enrobed in encaustic, giving strength to otherwise soft and yielding materials. Her work leans toward the sculptural, following her training as a metalsmith and glass sculptor at the California College of Arts and Crafts. It is is generally abstract with spare compositions allowing color and texture to convey emotion. The abstract expressionists Robert Motherwell and Mark Rothko and pastel artist Wolf Kahn have heavily influenced her, as have the enameled copper vessels of June Schwarcz. Born in New York, Frueh pursued a career in technology before turning her attention fully to art. Her early work in enameled silver was featured in galleries and juried art shows. After a hiatus of several years to raise her children, she began to work in encaustic and hasn’t looked back. Banner image: The Conversation, encaustic on wood, 14” x 20″.